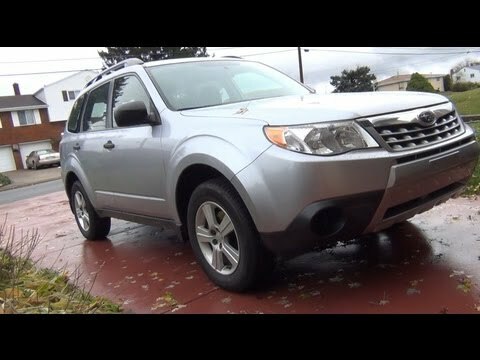 The 2012 Subaru Forester is one of the few compact with true off-road credentials thanks it its rugged underpinnings and standard symmetrical All-Wheel Drive. Despite its conventional 4-cylinder engine choices, the Forester is available as an environmentally-conscious Partial Zero Emission Vehicle (PZEV). One of the main reasons we bought a Forester was the height off the road. It's tall enough that I don't have problems getting in and out (I have bad knees, and low cars are difficult for me), and not so tall that I need assistance to get in. Subaru is a very safe car, and that was important also. We got leather seats, which I find to be extremely comfortable, far superior to cloth seats. I love how it drives, hugs the road ... we don't get much snow and ice here, but when we get a little, we can drive through it without special tires or chains. We've had our vehicle for over five years now, and it's only been in for routine maintenance. The only problem we've ever had with it was the indicator that lets you know when your tires are low on air. For a time, it would alert when there wasn't a problem, but the mechanic finally got the switch fixed for us. As problems go, that was pretty minor. I'd highly recommend a Subaru Forester. We most likely will replace this one with another (new model). Subaru Forester is great all-around vehicle for both average use and fun trips! We have really enjoyed our Subaru Forester because of the all wheel drive, sunroof, and trunk space. It is a comfortable car to drive long-distance and the seat heaters are great. I wish there were more technology features, like automatic headlights and auto-locking the doors when the car is in drive. We have had some issues with the electrical features of the car acting up, but this may have been due to a battery issue. We recently moved to a mountainous state and wish that the car was 6-cylinder rather than 4 because it does not handle gradual inclines well at higher speeds (highway driving in Colorado). We are pleased with the resell value and longevity of this vehicle, but it because the vehicle uses synthetic oil, we have to stay on top of regular oil changes and maintenance in order to ensure the longevity of the engine. Overall, we have been very pleased with this vehicle and would consider purchasing a Subaru again in the future. I really like the visibility in this car which is very important in staying safe on the road. I wish it got better gas mileage!!! I love the large back window but I don't like how snow collects on the front windshield. The wipers don't adequately clear it. It needs a little extra oil now that it's older but overall it's a very reliable car. It has a lot of storage and is very easy to pack. The seat warmers have been great in the long New England winters. The radio reception is not very good but I just plug my phone into the aux outlet and listen through an app. I don't need a lot of bells and whistles. It is just enough for me. I love my Subaru.